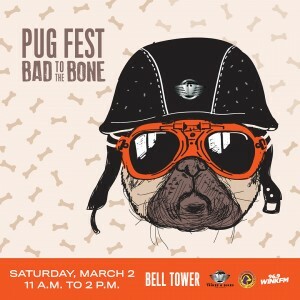 Good dogs and bad dogs are welcome at the 14th annual Pug Fest, which will be held March 2 at Bell Tower Shops. One of Southwest Florida’s favorite dog-friendly events, Pug Fest welcomes well-mannered canines of all breeds for a costume contest, fun activities and games of skill. This year’s Pug Fest theme is “Bad to the Bone,” so owners are encouraged to dress their dogs in costumes that showcase their pooch’s toughness and attitude. The event will feature various contests and games, including a costume contest as celebrity judges choose the “Best Bad Dogs” and a contest in which owners can show off the special tricks they have taught their pooches at home. Beer and wine will be available for purchase from Grimaldi’s with proceeds benefiting the Gulf Coast Humane Society. Pug Fest runs from 11 a.m. to 2 p.m. on Saturday, March 2 at Bell Tower Shops, 13499 S. Cleveland Ave. in Fort Myers. Bell Tower Shops has long been known as dog-friendly destination, and its Yappy Hour held on the second Friday of each month is one of Southwest Florida’s most entertaining evenings for dog-lovers and their pets. Bell Tower Shops is a landmark shopping, dining and entertainment destination centrally located in Fort Myers, Florida. The open-air center offers fine retail shops including eclectic boutiques and shopping favorites Williams-Sonoma, Chico’s, White House | Black Market, Victoria’s Secret, Pink and Talbots. Exceptional shopping is complemented by distinctive restaurants: Bistro 41, Cru, DaRuMa Japanese Steak House, Grimaldi’s Pizzeria, Blue Pointe Oyster Bar & Seafood Grill, Cantina Laredo, Mimi’s Café, T.G.I. Friday’s and Society. In addition to The Fresh Market, Bed Bath & Beyond and a 20-screen Regal Cinema complex, Bell Tower Shops is home to exceptional specialty retailers and restaurants including Society, World of Beer, Francesca’s Collection and Ulta. A community partner and pet-friendly destination, Bell Tower Shops hosts special events throughout the year, including concerts, fundraisers, art fairs and more. Visit www.thebelltowershops.com for more information. Madison Marquette merged operations with PMRG in June 2018 to create a new leader in commercial real estate. The firm offers PMRG’s leasing, property management, investment management and development services, combined with Madison Marquette’s specialized development, investment and marketing expertise. Madison Marquette’s strength in retail and mixed-use assets joins PMRG’s office, medical, industrial and multi-family capabilities to provide national leadership across asset classes. PMRG’s dominance in the southern US combines with Madison Marquette’s presence in primary gateway markets on both coasts to serve the top institutional owners and investors in the industry. The company provides leasing and management services to a diverse portfolio of 330 assets in 24 states and manages an investment portfolio valued at over $6 billion. The combined company is headquartered in Washington, DC with a major presence in Houston, TX, and will be transitioning to the Madison Marquette brand in the fourth quarter of 2018. With 600 professionals in 13 regional markets, the merged firm is a member of the Capital Guidance group of companies. For additional information about Madison Marquette, visit www.madisonmarquette.com.